L'Italie divisee en ses differens Etats dress d'apres les meilleurs Cartes appuyee sur les Observations Astromom'. A beautiful example of Rizzi-Zannoni's 1783 two sheet decorative map of Italy. 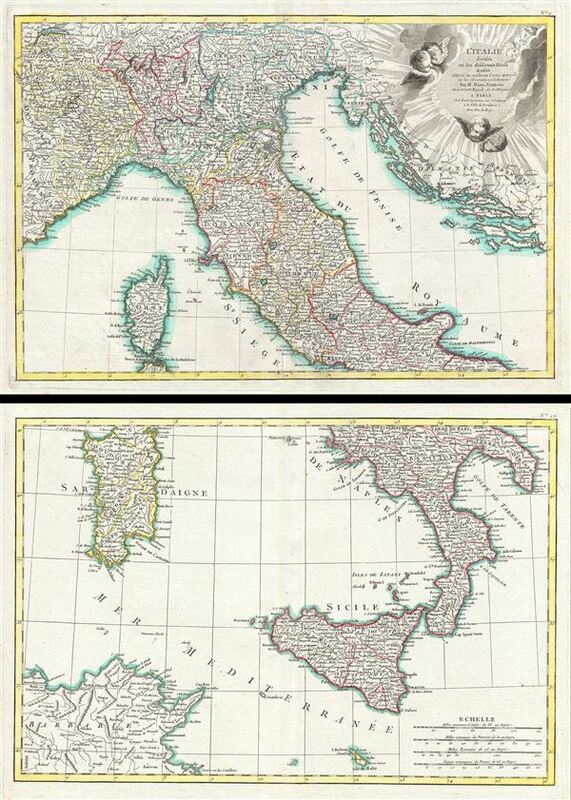 The upper sheet covers from Lake Geneva and the Venetian States south to include Rome, Corsica, and Capitana. It also includes the Gulf of Venice and the states of Dalmatia, Herzegovina and Murlaka. A large decorative cartouche featuring solar rays and numerous putti (little cherubs) appears in the upper right quadrant. The lower sheet covers from Naples south to include Sicily, Malta, Sardinia and parts of Tunisia and Algeria in North Africa. This map shows the Italian peninsula prior to its struggle for national solidarity which would emerge as a movement about 50 years later in the early 19th century. The peninsula is divided into numerous independent states, duchies, republics, kingdoms and, of course, the Papal States (States of the Church). A fine map of the region. Drawn by Rizzi-Zannoni in 1783 for issue as plate nos. 11-12 in Jean Lattre's 1783 issue of the Atlas Moderne. Giovanni Antonio Bartolomeo Rizzi Zannoni (September 2, 1736 - May 20, 1814) was an 18th century Italian cartographer active in Venice and Naples. Zannoni was born in Padua, Italy on September 2, 1736. Between 1749 and 1751 Zannoni studied Astronomy at the University of Padua under John Polen, a prominent astronomer of the period. After leaving the University, Zannoni was commissioned by the King of Poland, Augustus III, to map that country. Zannoni's subsequent survey is considered the first accurate triangulation of Poland. Afterwards Zannoni's services were in high demand and he traveled around much of Europe, working on various surveys in Denmark, Germany, Prussia, and Sweden. Around 1857 Zannoni was caught up in the hostilities surrounding the Seven Year War and, after one battle, was taken to Paris as a prisoner of war. Paris must have suited Zannoni for he remained there for nearly 20 years, even taking service with the Paris Engineer's Office. It was also here in Paris the Zannoni developed many of the cartographic contacts that would lead to a number of important cartographic publications, including the Atlas Moderne in conjunction with Lattre. In 1781 Zannoni was called to Naples by the Bourbon monarch there to help in the revision of the Charter of 1769. Afterwards he stayed on and produced a numerous important maps of the Kingdom of Naples. Zannoni is considered a careful and precise cartographer and his work, particularly the maps he made in Naples, have been praised by R.V. Tooley as "remarkable for a marvelously minute attention to detail, and amply deserves the commendation passed upon it by Sir George Fordham" (Tooley, Maps and Mapmakers, 21). Zannoni would spend the remainder of his days in Naples and passed away on May 20, 1814. Very good condition. Two sheets. Original centerfolds exhibit minor toning. Blank on verso. Rumsey 2612.028, 2612.029, 2612.030. Phillips (Atlases) 664. National Maritime Museum, 215.